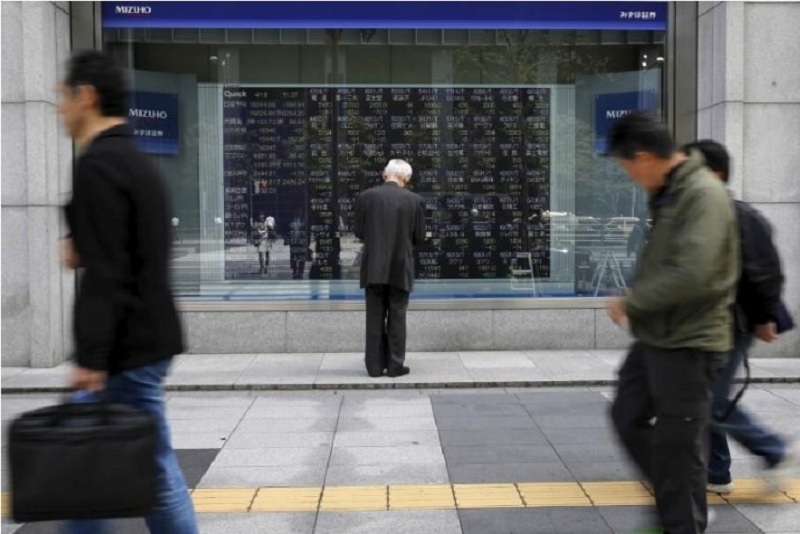 A man looks at a stock quotation board outside a brokerage in Tokyo, Japan, April 18, 2016. TOKYO - Asian stocks wobbled on Wednesday but still marked a 10-year peak, cheered by record highs on Wall Street, while shares of Apple Inc’s suppliers dipped following the release of the latest iPhone. Futures suggested a downbeat start to the European trading day, with the Eurostoxx 50 STXEc1 down 0.1 percent, DAX futures FDXc1 also down 0.1 percent and FTSE futures FFIc1 0.2 percent lower. MSCI's broadest index of Asia-Pacific shares outside Japan .MIAPJ0000PUS was slightly lower, after earlier poking up to its highest level since October 2007. Australian shares ended fractionally higher and South Korean shares rose 0.2 percent. “In the U.S. we had a bit of unwinding of the fear trade that it’s been going through and that’s flowing through to us as well,” said Mathan Somasundaram, a market portfolio strategist with Blue Ocean Equities in Sydney. U.S. gains were kept in check, however, by a decline in shares of Apple Inc after it unveiled its newest line of iPhones. Apple fell 0.6 percent but pared some losses in afterhours trade. The new iPhone’s sales will have repercussions beyond Apple for many suppliers as well as its rivals. Taiwan’s benchmark dropped 0.7 percent, as shares of Apple supplier Taiwan Semiconductor Manufacturing Co, the world’s biggest contract chip maker, dipped 0.5 percent, while Hon Hai Precision Industry was 1.3 percent lower. In China, Apple-linked stocks such as Zhejiang Crystal Optech tumbled 6.4 percent and Goertek shed 3.7 percent. The blue-chip CSI300 index was slightly up, while the Shanghai Composite Index was flat in afternoon trade. Japan's Nikkei stock index added 0.5 percent to a one-month high, getting a tailwind as the yen stayed far away for its recent peaks. Yutaka Miura, a senior technical analyst at Mizuho Securities, said the weaker yen had prompted investors to cover short positions that they took during recent bouts of risk aversion. “The Nikkei is not rising on fundamentals at the moment, but rather on supply and demand moves,” he said. The dollar inched 0.1 percent lower on the day to 110.11 yen, but remained well above last Friday's 10-month low of 107.32 plumbed when Hurricane Irma loomed and investors braced for the possibility of another missile or nuclear test to mark North Korea's founding day on Sept. 9. The yen tends to benefit during times of economic and political uncertainty due to Japan’s net creditor nation status, and the expectation that Japanese investors would repatriate assets during times of crisis. Investors remained wary of a flare-up of tensions at any moment on the Korean Peninsula, with U.S. President Donald Trump saying on Tuesday that U.N. sanctions on North Korea this week were a “very small step,” and “nothing compared to what ultimately will have to happen” to deal with the country’s nuclear program. North Korea remained defiant over the latest sanctions, vowing to redouble efforts to fight off what it said was the threat of a U.S. invasion. The euro was up 0.1 percent at $1.1979, while the dollar index .DXY was down 0.1 percent at 91.815, holding well above Friday's 2-1/2-year low of 91.011. Meanwhile, bitcoin skidded 4.8 percent to $3,975.43 on the BitStamp platform, after Jamie Dimon, chief executive of JPMorgan Chase & Co, said on Tuesday that the crypto-currency "is a fraud" and will blow up. Bitcoin slid 6.6 percent on Friday, after reports that China was about to shut down local crypto-currency exchanges. Brent crude LCOc1 slipped 0.2 percent to $54.18 per barrel, while U.S. crude CLc1 rose slightly to $48.25. Asian stocks wobbled on Wednesday but still marked a 10-year peak, cheered by record highs on Wall Street, while shares of Apple Inc’s suppliers dipped following the release of the latest iPhone.